Win an iPad by Downloading the QUIKRETE ® Mobile App. Homeowners and Contractors Enjoy Customized Experience from Any Device. DELIVERS RAPID STRENGTH AND WORKING TIME. 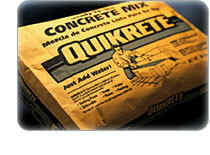 New Product Unveiled and Demonstrated at World of Concrete. High-Strength, Rapid-Setting Concrete Mix Restores Concrete Sea Wall.